GM brought Mary Chan on board as the President of Global Connected Consumer 13 months ago, perhaps providing her greatest challenge, even after 24 years in the development of the wireless community. 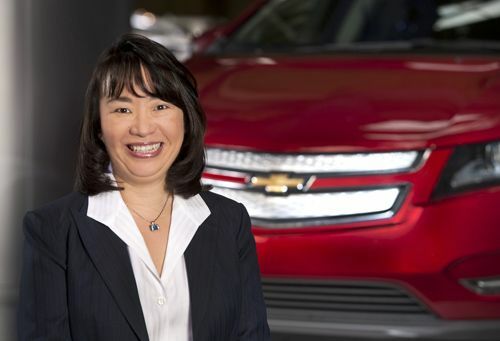 Chan came to GM from Dell Inc., where she was senior vice president and general manager of Enterprise Mobility Solutions & Services, and now is the director of GM’s global efforts to further safety, security, telematics and infotainment connectivity for the automotive giant. Just this week GM posted her answers to five questions outlining her plans for the car of the future and the apps she would like to see in the cars she drives herself – models from the GM line of course. The speed of information and data transmission are the focus of most of what GM is developing and it is certainly a team effort – a very large team. Chan is well qualified to lead this challenge as she was involved in the development of 4G LTE wireless broadband technology - the fastest service widely available today. Having taken the lead in automotive connectivity when OnStar was introduced 17 years ago, GM is in a unique position to advance the way automobiles enhance our lives and even begin to virtually read our minds, if Chan has her way. OnStar provides the foundation for GM’s efforts to incorporate advancements in the field, adding new infotainment and telematics to create the connected car to come. Customer feedback has informed the automaker that though safety and security are primary concerns to their consumers, other services made available via telematics are also of interest. “Our goal is to expand the suite of connected services offered in our vehicles with careful consideration to make sure these new features and services are relevant, add value for customers and are seamlessly integrated so drivers can stay focused on the road,” she added. GM and Chan expect that high-speed connectivity in cars will make them more competitive in the market over the next decade or more. They also think it is important to have such connectivity in the car, rather than leaving it solely in the hands of third parties. The division is pinning its fortunes on this dramatic commitment. The firm believes these systems can be used to save fuel, lower maintenance costs, and provide new and improved services to the automotive consumer in a safe and user-friendly manner. Why not just WiFi devices? Because GM thinks tackling the subjects from both ends is better for the consumer. Their system will still work with passenger’s phones, netbooks and so on. The flexibility of the system they are building is its greatest asset. Consumers will be able to upload new apps to the car, allowing the personalization and customization of the driving experience after purchase. GM is setting up their own App Shop within the onboard software that will allow consumers to find the apps they need and want, once developed by third party firms. It is a vision of a brave new world of connectivity. What would Chan’s app be? Why can't your car be a personal assistant? Chan can foresee the car texting the kids to tell them when she will arrive to pick them up. It should know to turn down the music or even change the channel when the kids are in the car, which means it should know if they are. Why can’t it sync with your calendar, thereby planning optimal times to refuel or recharge to make your appointed rounds? When driving another car, wouldn’t you like your preference settings and music to follow you (presumably to another GM vehicle) with no added effort on your part? So that is the world according to GM’s guru of Connectivity, Mary Chan. We’re sure that’s a name we’ll be hearing a lot in the days to come. “One thing I am sure of is that connectivity in the vehicle will unleash a new era of creativity just as it has with smartphones, tablets and PCs,” Chan concluded. We suspect she’s absolutely right.